These speaker brackets are designed to mount speakers with an easy mounting system to the wall. 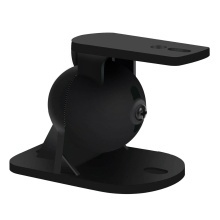 Each bracket can support a speaker weighing up to about 7lbs. The wall mount speaker brackets can be adjusted for swivel and tilt to point each speaker at the proper angle for an optimum experience. Adjustable: The ±70° swivel and ±20°tilt adjustments enable to control the direction of your sound for optimum audio experience. Widely Used: Simple and straightforward design, suitable for a wide range of single point speakers (with single rear entry fittings). Weight Capacity: Each bracket can support speakers weighing up to 7lbs. It is a great option for your home theatre set up. Easy to Install: Comes with easy install kit including screws, no complicated installation steps, save your time. Package Includes: 2 * Wall Speaker Wall Mount Brackets, 1 * Mounting Hardware Kit. Note: Speakers must have 1 single threaded screw-hole in order to fit these speaker brackets.